Real-time flood forecasting is one of the most effective flood risk management measures. Indeed, many governments operate bespoke hydrological forecasting services that continuously monitor and forecast coastal and fluvial water levels. These services heavily rely on data and models, on ICT infrastructures and on forecasting expertise. 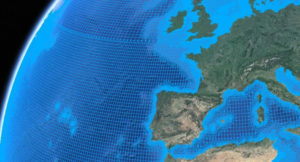 Deltares is a prime supplier of such infrastructures and forecasting expertise to many agencies around the globe. Thus, we directly contribute to the safety of populations exposed to flood risk. Also, as many of the tools developed by Deltares are used by consultants and engineers in their commercial activities, we contribute to the economic activity of the Dutch water sector. To ensure that our tools and expertise remain at the “state of the art”, continuous developments and investments are required. Some of these investments have a long-term character. This means that decisions are made in the face of uncertainty about the more distant future. Such uncertainty about the future cannot be eliminated but it can be reduced through forecasting (as indeed we often tell our clients!). For our own investment decisions, we would like to have some idea of what our world will look like in, say, 2025. We have long known that it is pretty much impossible to accurately predict what the world will look like in 2025. However, it may well be possible to ‘capture’ the real world of 2025 in a set of scenarios that ask “what if?” questions, helping us explore alternative views of the future. Such scenarios contribute to improved decision making by allowing for any decision to be tested for robustness against those alternative futures. At Deltares, we have now applied scenario analysis to the discipline of real-time hydrological forecasting. The process was developed with help of Hans Stavleu, an experienced scenario writer and contributed to by a number of our partners. First, we organised a brainstorming session in which we identified and described ongoing trends and future developments. These were subsequently elaborated on by five writers in a five day stint. Authors included Micha Werner, Femke Schasfoort, Robert Mureau and Marc Philippart – and me! We first identified the scenarios we would write. This was done using a matrix comprising a ‘government’ and a ‘technology’ axis. Each of these contained three viewpoints characterising possible future government focus and technology focus respectively. Thus, nine possible scenarios were constructed. 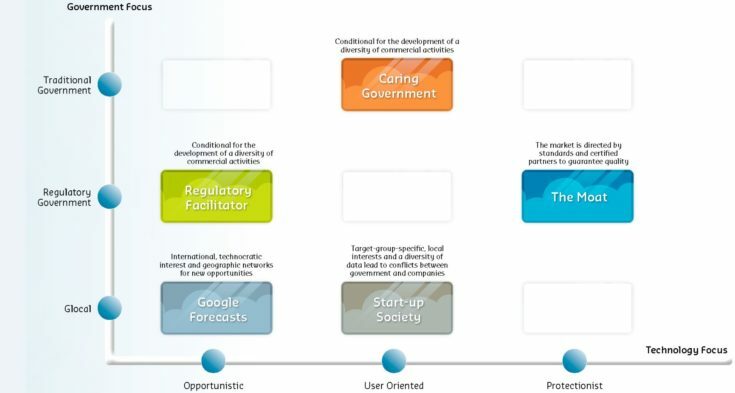 We selected five scenarios to be fully developed – one by each author: Caring Government, Regulatory Facilitator, Google Forecasts, Start-up Society and, last but certainly not least, the Moat. Now that we have the scenarios available, we have a wonderful tool available to increase the robustness of our strategic planning. I’m much looking forward to that next step! Download the report here. Additional information can be obtained from Jan Verkade, Daniel Twigt or Nadine Slootjes. Dr Jan Verkade is a hydrologist with a keen interest in hydrologic forecast – warning – response systems. He has completed a PhD project in which he extensively researched the estimation, use and verification of estimates of predictive atmospheric and hydrologic uncertainty. Specifically, he has researched and published on the benefits of estimating predictive uncertainty, on the effects of post-processing of precipitation and temperature forecasts on stream flow predictions and on effectively using estimates of predictive hydrologic uncertainty. The knowledge and experience gained in the PhD research project have been applied in projects in Ireland, Sudan, Australia, the United States, Canada, The Balkans, China and the Netherlands. In addition, Jan has ample experience in the development of operational, real-time hydrological forecasting systems.